I agreed with the Koch brothers guy. How’d that happen? The last thing I expected happened. I liked the Alaska director of Americans for Prosperity, the Koch brothers' group, and agreed with a lot of what he had to say. I first met Jeremy Price at a federal agency hearing on opening the Arctic National Wildlife Refuge to oil drilling. Outside, I had listened to speakers at a rally representing environmental and Alaska Native groups, an outpouring of feelings about the injustice of industrializing that unspoiled land. Inside, Price said he is also a real Alaskan. He grew up in Salcha, on the Richardson Highway near Fairbanks. His close-cropped, slim-fit Western look was appropriate for the meeting room but would also work in a pickup in his big-sky hometown. His testimony thanked President Trump for opening ANWR and noted that Alaska's congressional delegation had long supported drilling. It was an argument for democracy. The people spoke. Do their work. But in our complex system of money and power, democracy isn't so simple. Price's group is funded by oil billionaires who used their wealth over the last quarter-century to build a vast political machine pulling America to the right and boosting their own business concerns. The Kochs' brilliant idea was to spend their unlimited fortune to fund more than candidates. They supported think tanks, causes and community fights that developed conservative ideas and political talent. Rather than just buying politicians, they changed the rules. For example, they paid in part for the lawsuit that led to last month's Supreme Court decision cutting the heart out of public employee unions. Americans for Prosperity has three times the staff of the Republican Party nationally. Under the Supreme Court's 2010 Citizens United decision, it can spend unlimited amounts on politics without revealing donors. With three staff in Alaska, Price's organization is bigger than the Alaska Republican Party, too. But it doesn't act like the Republican Party. Price pulled me in with an issue designed to appeal to a liberal. He showed a picture of an expert haircut by a Spanish-speaking barber who can't pass an Alaska licensing test. He says occupational licensing is an instrument of discrimination and exclusion. I think he's right. I plan to come back to that issue. Libertarianism comes from the left as well as the right. Alaska's extremes agree on issues of freedom. It's an opportunity for unusual alliances. In 2017, Price mailed attack ads against Rep. Jason Grenn for supporting an income tax. Grenn, an independent from West Anchorage, had joined the Democrat-led House coalition and held a seat on the Finance Committee. But this year, Grenn also sponsored a "right-to-try" bill that allows terminally ill patients to use unapproved drugs. Price is rewarding him with a public event next week. Grenn said he made no deal with Price. Both the mailers and the invitation to speak came as a surprise. Price explained the switch as an example of his issue-based integrity. "We didn't agree with his view on the income tax, but if you only work with people you agree with on everything, you're not going to get much done," he said. "I'm going to applaud anyone who tries to achieve a free-market solution to a problem." Price said he also ran ads last year thanking Rep. Adam Wool, D-Fairbanks, for supporting legislation to allow Uber and Lyft to operate in Alaska. He knew how to push my buttons, but I appreciate that. I like meeting people who are good at what they do. Price seems authentic and rooted. Also, bright, articulate and candid about what he is trying to do. After leaving the family construction business in Salcha, Price graduated from Utah State University in 2005, then worked for Rep. Don Young and Sen. Lisa Murkowski in Washington. While working for Murkowski, he also earned a master's degree in public policy at Johns Hopkins University. 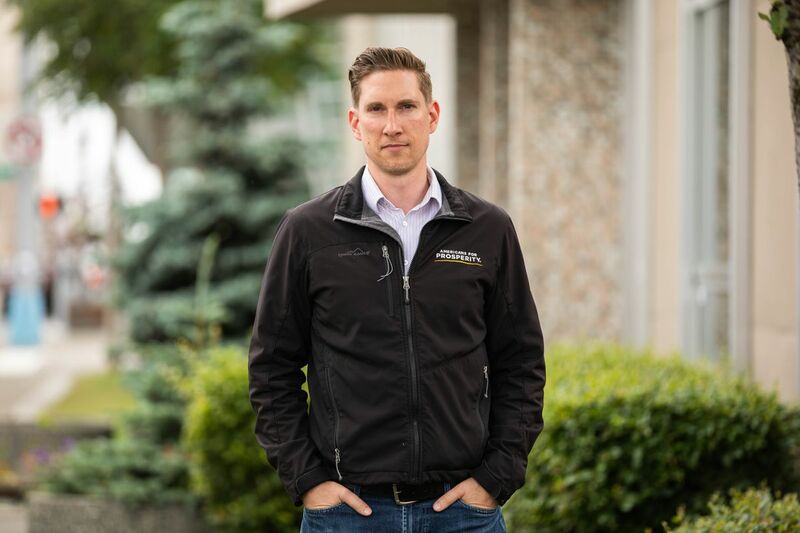 He worked two years at the American Petroleum Institute, the oil industry trade association, before returning to Alaska in 2014 to start the Americans for Prosperity office. I challenged Price on his Koch-brothers backing. But he countered that in the next-door office suite on Seventh Avenue, Alaska Audubon also receives outside funding. A fair point, but Audubon's type of nonprofit status prohibits political activity. Besides, Alaska Audubon gets 65 percent of its money from within Alaska, said interim director Michelle LeBeau. Americans for Prosperity won't disclose its funding. And there's a deeper difference. Audubon's mission of conservation is altruistic. A healthy environment serves everyone. Koch Industries is one of the nation's worst polluters and a repeated environmental law-breaker. The Kochs benefit personally from getting rid of regulations, lowering taxes and weakening the government. I agree that basic liberties are a fundamental good. Freedom of speech, association, religion and the like are necessary to human well-being. But extreme libertarianism appeals only to the strong. Of course lions are against control of their power. It's the much larger herd of antelope who needs to stick together for mutual protection. When it comes to education, public safety and the environment, I'm with the antelopes. I expected Price to be a spokesman for the lions — or, more precisely, those husky, gun-toting dudes who inarticulately demand government off their backs and demonize the weak, making a virtue of simple selfishness. The anti-tax platform does have some of that flavor, like the Koch brothers' campaign around the country to prevent mass transit projects and opposition to climate change action. Whatever it takes to add to their already colossal wealth based on oil. But what many of my liberal friends don't appreciate is that government regulation is also a tool of the powerful. Some regulations protect the public. Others protect businesses or professions from competition, segregate housing areas, and otherwise cement the status quo. Industries capture regulators and control politicians for their own benefit. When Price uses the Kochs' money against that, I'm with him.